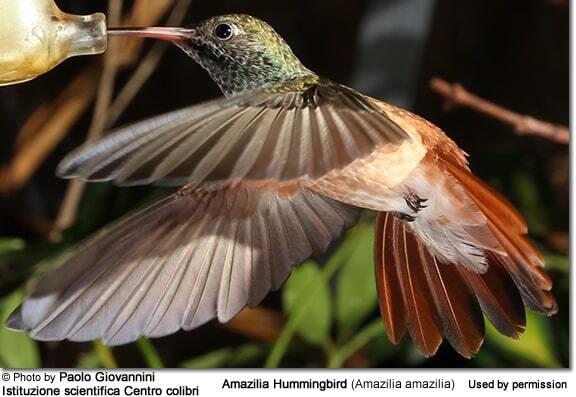 The Amazilia Hummingbird (Amazilia amazilia) occurs naturally in South America, specifically western Peru and Ecuador. 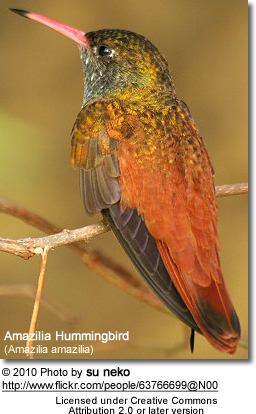 This hummingbird is generally common within its range, and can regularly be seen in urban areas, including large cities such as Lima and Guayaquil. It prefers dry, open or semi-open habitats, but is also found in forest areas. Found west of the Andes from western Ecuador to northern Peru; along the eastern slope in southeastern Ecuador (upper Zamora Valley). Found in southwestern Peru (Nazca Valley). 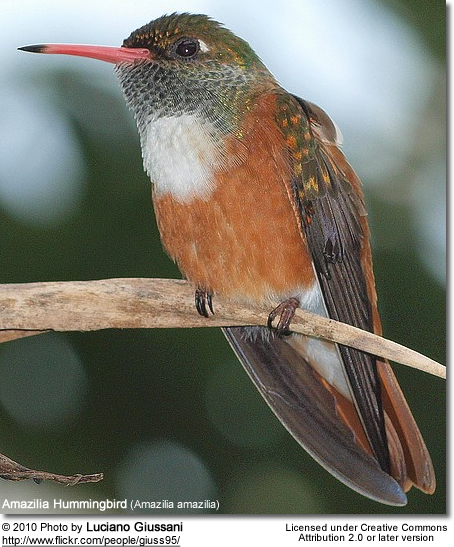 It is easily recognized by its black-tipped red bill and mainly rufous underparts. 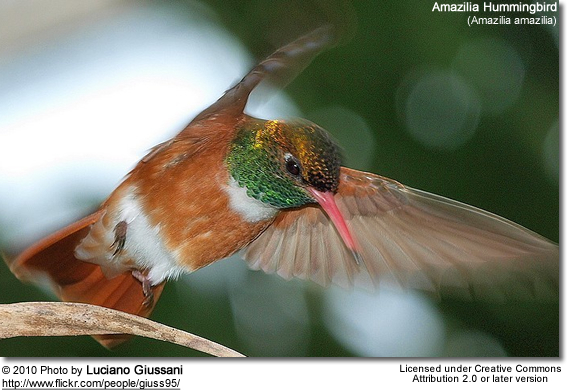 The Loja Hummingbird (A. alticola) is sometimes considered a subspecies of the Amazilia. 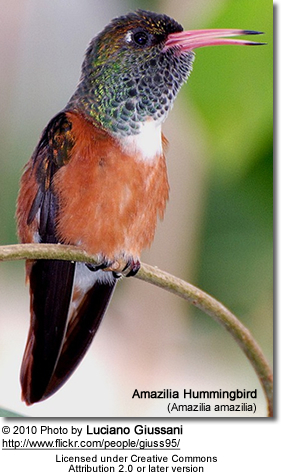 It can be identified by the color of its underparts, which shows less rufous. 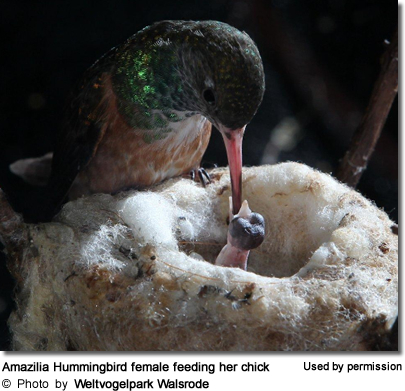 The female Amazilia responsible for building the cup-shaped nest out of plant fibers woven together and green moss on the outside for camouflage in a protected location in a shrub, bush or tree. She lines the nest with soft plant fibers, animal hair and feather down, and strengthens the structure with spider webbing and other sticky material, giving it an elastic quality to allow it to stretch to double its size as the chicks grow and need more room. The nest is typically found on a low, thin horizontal branch. 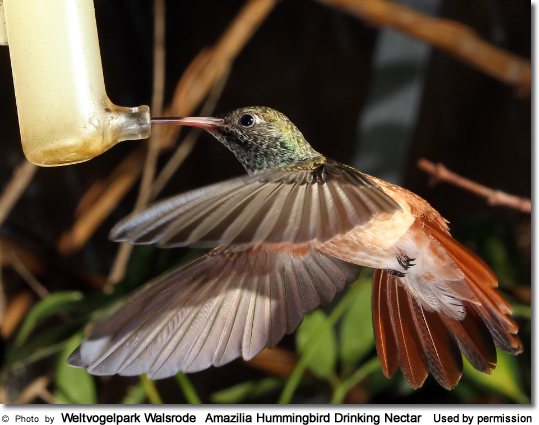 The Amazilia Hummingbirds primarily feed on nectar taken from a variety of brightly colored, scented small flowers of trees, herbs, shrubs and epiphytes. They favor flowers with the highest sugar content (often red-colored and tubular-shaped) and seek out, and aggressively protect, those areas containing flowers with high energy nectar.They use their long, extendible, straw-like tongues to retrieve the nectar while hovering with their tails cocked upward as they are licking at the nectar up to 13 times per second. Sometimes they may be seen hanging on the flower while feeding. They also take some small spiders and insects - important sources of protein, particularly needed during the breeding season. Insects are often caught in flight (hawking); snatched off leaves or branches, or are taken from spider webs. 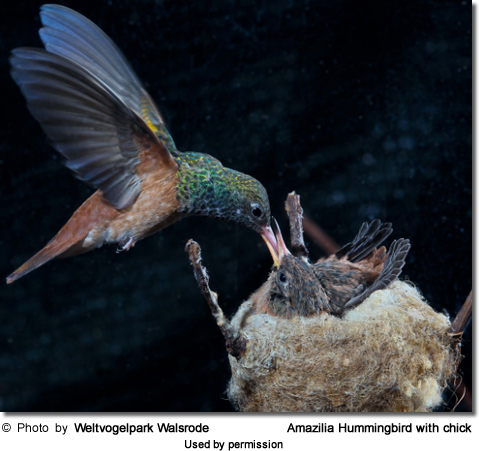 A nesting female can capture up to 2,000 insects a day.